"What's your favourite scary movie"? There's no denying that the Scream movies had a huge impact on the horror genre in the last decade and a half, whether you like them or not. You only have to pop out on Halloween to see that the spooky visage of the Ghostface Killer is now ingrained heavily into the collective consciousness and has become a must-have costume for guys wanting to scare the bejesus out of the girls successfully. I know my missus hates the costume and even ended up knocking out a guy on the dancefloor years ago when he jumped her from behind, big mistake. 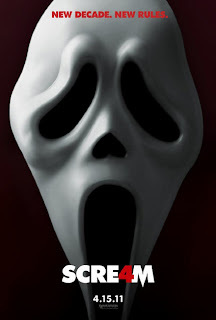 Soooooo you may or may not have been aware that the Scream franchise has a fourth film in April 2011 featuring a few very familiar faces from the previous outings and a load of new ones to boot. I'm actually quite looking forward to this and also to the fact that they might finally knock off Neve Campbell and Courteney Cox too!